Roll took pains to not that these unaffiliated Pentecostals were apocalyptic in nature, but were not as otherworldy as some historians insisted. Indeed, messianic prophets incited a kind of nationalism in rural black communities. Indeed, one premillenialist preacher claimed that Japan would lead a crusade to defeat white imperialism. He used the Book of Ezekiel to claim that Japan would drop poisonous bombs on the U.S. that would kill all American whites and apostate blacks, save for 144,000 chosen. There is video of Roll’s talk, but unfortunately only the first ten minutes, before, apparently, he got to the good stuff! I’d love to know when this claim was made. Given the focus of the panel, it’s presumably in the 1930s, and probably post-Manchurian Incident. I wonder if this preacher was just using Japan as a foil because of general tensions with the US or if the GEACPS rhetoric was widely enough known (and considered credible) to actually be cited in this context? Either way, it’s the first time I’ve heard Japan used as a means of apocalyptic fulfillment of any prophecy other than Nichren doctrine and a few Japanese New Religions. 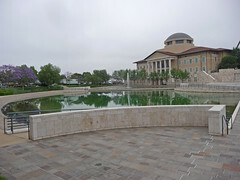 ASPAC was at Soka University of America this year. It’s in the hills above Laguna Beach, just down the road from Irvine, on the edge of a nature reserve. The campus is new — they opened in 2001 — and compact, with shiny new buildings and real ambition. 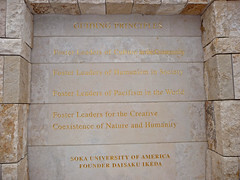 Being a hilltop campus, there’s a lot of stairs; being in southern California, and near a nature preserve, there’s some lovely flora and fauna on campus, and I think I’ve solidified my reputation among my conference colleagues as “the camera guy.” Like so many American colleges, Soka U. has a religious foundation to its community and pedagogy, but is open to non-Soka Gakkai students and faculty1 and has a secular, transformative mission. The NYTimes Lede blog [thanks, Mom!] linked Michael Phelps’ marijuana scandal to a scandal in Japanese sumo1 which has resulted in four retirements. “Shinichi Suzukawa” is not his “real name” but his birth name. Sumo wrestlers take on a new name when they enter the sport, and many will take on another when they reach high rank. After they retire, they give up their fighting name and take on a new name, often one based on their stable or coach’s name. The Japanese tradition is much more flexible than the Western tradition in regard to names. The name thing and the “monkish discipline” are clear reminders that Sumo, though it’s been a part of the entertainment world for a long time, has its origins in Shinto ritual. The accoutrement of the referrees are drawn directly from priestly garb; the throwing of salt and stamping rituals for purification, etc. There was a pretty substantial period — most of the Tokugawa era, really — where Sumo seems to have been somewhat divorced of these practices (though ukiyoe of bouts show the presiding referees clearly in traditional garb), and sumo wrestlers were more like free agents and daimyo retainers, but when the modern sport is formulated in the Meiji and Taisho eras, it is clearly resacralized, almost certainly as a result of the state-sponsored resurgence of Shinto and the desire to connect it to a reimagined family-state tradition. The name changes, then, are also part of this religious tradition: the tradition of taking a new name when taking religious orders is well-known in Buddhism; the tradition of taking on a new name for a new stage in life, and the pseudo-kinship relationship between a stablemaster and his wrestlers also play a role. Not only can its contents be read in English and searched online, but I was delighted to find that it has released the contents under a Creative Commons license (Attribution-NonCommercial-NoDerivs) that gives visitors the freedom to copy and distribute the material they find there if they provide attribution. The 21st century Centers of Excellence (COE) Program at Kokugakuin University (Tokyo, Japan) is pleased to announce the completion, in March 2007, of the online version of its Encyclopedia of Shinto (EOS). EOS was compiled as part of the four-year (2002-2006) COE program entitled “Establishment of a National Learning Institute for the Dissemination of Research on Shinto and Japanese Culture” (please see the address below). The online EOS is a revised and translated digital version of the entire contents of the reduced-sized edition of the Encyclopedia of Shinto edited by the Institute for the Study of Japanese Culture and Classics (IJCC) at Kokugakuin University; it was published by Koubundou in 1999. The original encyclopedia is comprised of nine sections, three of which have been translated into English and published in print form (Section Two, Kami; Section Four, Shrines; and Section Eight, Schools, Organizations, and Personalities). Under the COE program, all nine sections have been newly edited and translated into English, and photos, audio, and video files have been created and linked to the text; the entirety is available on the web. 40 researchers both within and outside of Japan contributed to the translation and correction process, and around 30 staff members of the COE project were involved with editing and uploading the information. The Encyclopedia of Shinto is designed for anyone who would like to know about Japanese culture related to Shinto in English, and presents a wide range of material related to Shinto with clear academic explanations. It should also be helpful for Japanese people when explaining Shinto in international situations. EOS has been partially available on the web for some time, and has already been accessed many times. However, in light of its recent completion, we hope that an even greater number of people will be made aware of its existence and will use it frequently. In the future, we plan to supplement and improve the content further, hoping to make EOS an even more accessible and reliable reference source. The new online Encyclopedia of Shinto is a product of considerable expenditure and effort, and therefore we sincerely hope that you will make full use of it. Ralph Luker sent me a link which I’d seen before, but lost: Arimasa Kubo’s “Israelites Came To Ancient Japan” pages. It’s a great mix of logical and historical fallacies, mostly having to do with ignoring actual archaeological evidence of Japanese origins and traditions. Most of the rest have to do with ignoring the commonality of certain practices among world religions (as my father says, if all you have is two points, you can draw a line). There are a few which are kind of interesting, but they are usually local customs which are not “Japanese” in the sense of being common to any significant portion of the population and which are rather poorly sourced. At some point, I suppose, I ought to check out the books that he cites, to see if they have footnotes to anything remotely credible. I have spent the last few days working on a syllabus for a course titled “Anthropology of Social Movements,” and I figure I could use some help from our regular visitors of the Well. One section of the class will be devoted to a reading of Oe Kenzaburo‘s The Silent Cry (Mannen gannen futtoboru). This book will be read in conjunction with E.P. Thompson‘s essay “The Moral Economy of the English Crowd in the Eighteen Century”(Past and Present 50:76-136). Here’s where I need help. I am looking for one or two short pieces that might help fill out the historical background to the novel. Basically I am looking for a piece on Anpo and another on Tokugawa period peasant insurrections (ikki and uchikowashi). The pieces have to be in English, and I’d rather have them make sweeping unprovable claims about the historical significance of these events rather than have them stuffed with historical details. If there is something out there that discusses Anpo and ikki in one broad stroke, that would be most ideal. But Anglophone scholars have only begun to explore that sort of post-Anpo New Left sensibility, perhaps most famously articulated by Yoshimoto Takaaki. Or maybe works do exist, and I’m sure they do in research on literature, so it would be great if someone could refer works here. The entire course is designed as a long argument against analyses of social movements by economistic Marxism (or in the case of Japan, koza-ha Marxists) and modernization theory. The Silent Cry section will help students understand the “human consciousness” aspects of social movements and will come right after a section on millenarian movements around the world such as the cargo cults of Melanesia and the Ghost Dance movement of North America. The AHA’s flagship journal American Historical Review doesn’t run Japanese articles all that often and, to be honest, interesting ones even more rarely. But the current edition’s foray is quite worth reading, though I’d like to know if other people’s reactions to it were as reserved as mine. The article is Japan’s Global Claim to Asia and the World of Islam: Transnational Nationalism and World Power, 1900–1945 [AHA membership required] by Selçuk Esenbel, whose previous publications are mostly in the field of Tokugawa peasant studies. She chronicles decades of intellectual, military and cultural contacts between Japanese and Islamic activists in a variety of fields, but most sharing an anti-Western (or anti-colonial or anti-imperial) modernism. Many of the Japanese names involved are familiar to scholars of Japan’s early-20c right wing, but the degree to which they concieved of political Islam as an ally and bulwark against Near/Middle Eastern colonialism is quite striking. It shouldn’t be, I suppose: these thinkers were so ambitious and global in their ideas that they must have had some concept of how a major world religion fit into the scheme of things, and Japan’s affinity for (i.e. sense of leadership of) modernizing societies in this period was still strong. There were two main directions to the interaction: scholarship of Islam in Japan (including a surprising number of conversions) and spreading Japanese anti-Westernism in Islamic regions. Pan-Islamism, as Esenbel describes it, isn’t that different from Pan-Asianism as the Japanese preached it, and figures like Ōkawa Shūmei made the connection explicit in print and in personal contacts. The weakness of the article comes when she tries to make a case for the importance of these theories and contacts. Aside from the interesting new depth it gives to Pan-Asianism, and filling in some of the gaps in the “they really thought they could win these wars?” lists, Esenbel tries to draw some connections to late-20c/21c political Islam, particularly violent Islamist groups. This seems like a huge stretch to me, without making much more explicit personal or intellectual connections between modernist anti-westernism and nihilistic traditionalism in Islamic radical circles. Contemporary Islamism isn’t akin to Ōkawa’s pan-Asianism, but something more like Kita Ikki’s agrarian nationalism: positing a perfect (unattainable) protean socio/cultural/economic “moment” against which the present does not measure up and the “re”establishment of which will require revolutionary and violent action. As others have argued, Islamism isn’t anti-Orientalist as much as it is Occidentalist, and I don’t see that emerging clearly in this history. Am I looking for the wrong things here? Missing something fundamental?